We want to equip parents with the information that allows them to see the actual dumbing down that is taking place in classrooms across the country. 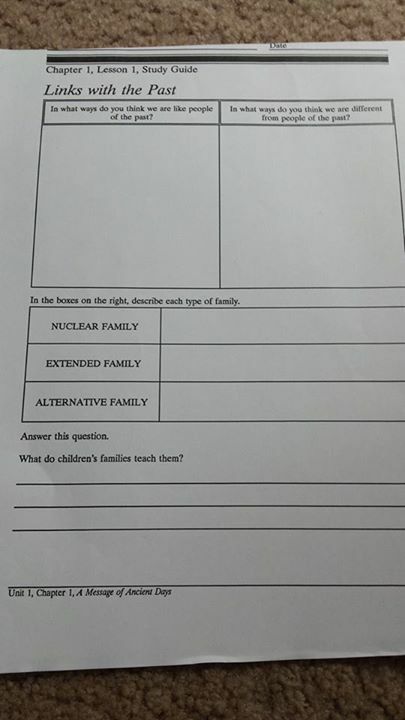 In this latest example from a 6th grade Social Studies class, the parent who posted this social studies assignment asked: From 6th grade social studies… what is an alternative family? 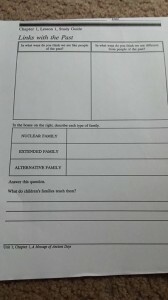 Most parents expect assignments to focus on academics. This is the time when children build a foundation of knowledge. Once that happens, they can then draw upon that knowledge to form educated opinions and make decisions. Our goal is to promote literacy in education and these kinds of assignments fail our children. Below is the scope and sequence for 6th grade History and Geography. Compare what Core Knowledge identifies as “academic content” for 6th graders versus this social studies assignment above. Schools are now focusing on changing attitudes and values in students versus giving them a foundation in academics. That is promoting ILLITERACY versus LITERACY and your children are at risk if you do not speak up and step in. One additional note: Core Knowledge gives their scope and sequence away for FREE. You can take the scope and sequence to your local school and ask your board members to incorporate it into the k-8 framework. of enduring ideas from these civilizations—ideas about democracy and government, for example, or about right and wrong. After this study of lasting ideas from ancient civilizations, the World history guidelines pick up the chronological thread from earlier grades with a study of the Enlightenment. you are encouraged to use timelines and engage students in a brief review of some major intervening events in order to help students make a smooth transition across the gap in centuries between the ancient civilizations and the Enlightenment. In sixth grade, the World history guidelines catch up chronologically with the American history guidelines. The World history guidelines take students up to the consequences of industrialization in the mid-nineteenth century, and this is where the American history guidelines begin. Teachers: By sixth grade, children should have a good working knowledge of map-reading skills, as well as geographic terms and features introduced in earlier grades. The study of geography embraces many topics throughout the Core knowledge Sequence, including topics in history and science. Geographic knowledge includes a spatial sense of the world, an awareness of the physical processes that shape life, a sense of the interactions between humans and their environment, an understanding of the relations between place and culture, and an awareness of the characteristics of specific regions and cultures. many geographic topics are listed below in connection with historical topics. Teachers: Since religion is a shaping force in the story of civilization, the Core knowledge Sequence introduces children in the early grades to major world religions, beginning with a focus on geography and major symbols and figures. here in the sixth grade the focus is on history, geography, and ideas. The purpose is not to explore matters of theology but to understand the place of religion and religious ideas in history. The goal is to familiarize, not proselytize; to be descriptive, not prescriptive. The tone should be one of respect and balance: no religion should be disparaged by implying that it is a thing of the past. (grade 4), and Buddhism/Shintoism (grade 5). Teachers: Briefly review from grade 2: religion, art, architecture, daily life of ancient Greece. Socrates was Plato’s teacher; we know of him through Plato’s writings. For Socrates, wisdom is knowing that you do not know. Teachers: Briefly review from grade 3: romulus and remus, roman gods, legends, daily life, etc. Teachers: you are encouraged to use timelines and engage students in a brief review of some major intervening events in order to help students make a smooth transition across the gap in centuries between the ancient civilizations and the Enlightenment. place the Enlightenment (17th and 18th centuries) in chronological context, in relation to eras and movements studied in earlier grades (middle Ages, Age of Exploration & renaissance, American revolution, etc.). Teachers: While the focus here is on the French revolution, make connections with what students already know about the American revolution, and place the American and French revolutions in the larger global context of ideas and movements. Communists, in contrast to Socialists, opposed all forms of private property. • The name “Latin America” comes from the Latin origin of the languages now most widely spoken (Spanish and Portuguese). Many thousands of African-Americans move north. This entry was posted in Academic Standards, Curriculum, Inappropriate Lessons and tagged 6thgrade, assignment, CoreKnowledge, SocialStudies on September 4, 2015 by SCC.